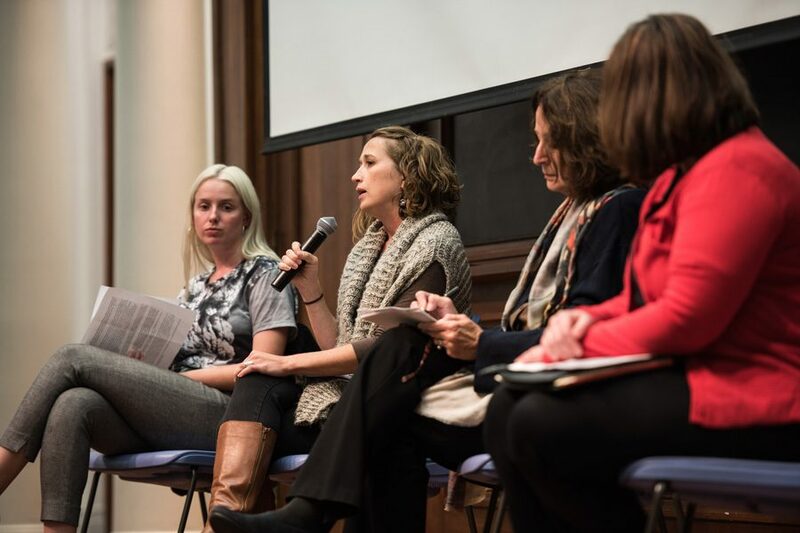 April Harrington, development director at Growing Home, speaks during Real Food at NU’s panel Tuesday night. The panel, held at Harris Hall, discussed food insecurity as part of this year’s Food Week. The issue of food insecurity not only involves access to food, but also education and making financial and nutritional decisions, panel speakers said Tuesday night. On Monday, the group also celebrated Food Day, a national initiative to promote “real food” and encourage cleaner food policies. Food insecurity describes a lack of regular access to food and is not limited to people experiencing homelessness or those without a job, said panelist Amy Laboy, senior director of programs at the Greater Chicago Food Depository. Laboy said access to food is important, but supporting education and job opportunities is necessary to end hunger. She also stressed that eating healthy is important. She said people who experience food insecurity often deal with health issues. People who are food insecure often eat as much as possible when they have food in front of them, as they often do not know when they will eat next, Laboy said. The intersection between health and food insecurity is clear in Chicago’s Englewood neighborhood, said panelist April Harrington, development director at Growing Home, a nonprofit urban farm in the neighborhood. Harrington said the most accessible meals are either fast food or processed food, and about 60 percent of children age 2 to 18 there are overweight or obese. But Harrington said education can combat food insecurity. For example, Growing Home sells fresh food straight from its farms, and demand for that has slowly risen, she said. “Education has been key in increasing that demand for our produce in Englewood,” Harrington said. She said other aspects of that education include ensuring people know how to prepare produce efficiently to avoid waste, with an end goal of educating people about how to prepare food with as few ingredients as possible. McCormick senior Kara Rodby, Real Food at NU co-president, said the group chose to focus on food insecurity because of its prevalence in the Chicagoland area.